Lots of direct marketing (DM) is done today using email, but nearly half is printed. Postcards, invitations, flyers, and catalogs still arrive in the mail. The best of them all are addressed to you while those addressed to "current occupant" usually heads straight to the trash. DM could easily be described as advertising targeted to an individual. It is trackable and responses are measureable. Good direct marketing is always a system with a clear call to action, a method in which to act and a benefit for the respondent as well as the sender. In addition to the possibility of selling something, the marketer can use DM to gather information and other data about the respondent. Smart marketers will often trial several different offers, language or lists and use the response data to fine-tune and improve their future efforts. One-time direct mail programs can't do this, but still can be successful. If you are considering a DM program, be aware what is considered successful. Response rates of 3-5% are considered excellent. In some circumstances even 1% response rate is darn acceptable. To ensure you have a good response, make sure you have the right list, the right offer or incentive, proper timing, an obvious call to action, and a way to collect and measure responses. I've conceived, developed and implemented many DM programs and know how to make these programs work. Let's make one work for you. Contact me. The above postcard was produced in collaboration with pbeach illustration, now based in Miami. Pete came to me for some creative and I delivered multiple themes along with concept art. Though Pete did the amazing final illustration, I wrote the headline and copy. It wasn't my best headline though. The original was "Spit and Polish." Click on the above image for an enlarged version. Can you benefit from printed DM? Probably. Unlike general advertising you'll pick exactly who you contact and when. You can make a more detailed case, even tailor individual message according to demographics or other data. Just be sure to be ready to manage your own expectations, as response rates can be miniscule in comparison to the list you use. 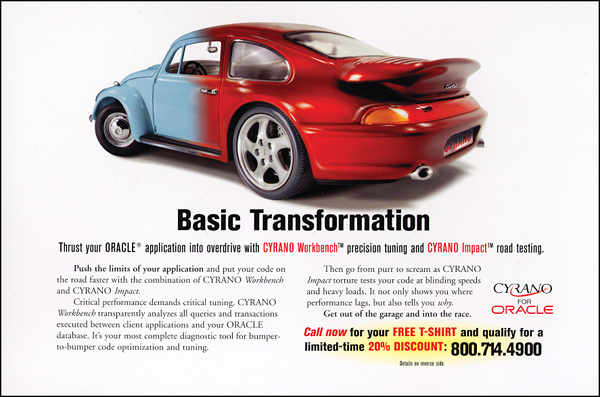 A direct mail postcard for Cyrano Software. This is the only illustration on my site done by another illustrator, my great pal pbeach.